A large group stayed up late to but their "Ticket to Fun" at Aaron Tippin Outdoors. 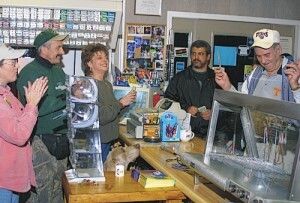 Pictured - Tammy Nalley and Aaron Tippin look on as Louie McDowell (right) purchased the first ticket. "I'm glad everybody came out to the store to be the first ones to buy lottery tickets in DeKalb County," Tippin told The Times. "I encourage everybody to play responsibly and don't forget that it's going to a good cause to support higher education in Tennessee." Two decades of work finally paid off in May 2003 when the Legislature voted to establish a lottery in Tennessee, and Gov. Phil Bredesen signed legislation in June 2003 making the lottery in Tennessee a reality. Today, the Tennessee Ticket to Fun has arrived with sales beginning all throughout the State. The games -- Tennessee Millionaire, Tennessee Treasures, Lucky 7's and $100,000 Jackpot -- will cost between $1 and $5 and award prizes up to $1 million. "These first four games start us on our mission to raise millions of dollars to fund college scholarships," said Rebecca Paul, CEO of the Tennessee Lottery. Tennessee Millionaire: Match three dollar amounts and win up to $1,000. Match three "entry" symbols, then mail in the signed ticket to be entered in one of three grand prize drawings that will give three players the chance to win $1 million each. Ticket cost: $1. Overall odds of winning: 1 in 4. Tennessee Treasures: Match winning numbers and win up to $25,000. Tickets depict regional scenes including: Downtown Chattanooga, Knoxville's Sunsphere, Memphis' Beale Street, Nashville's downtown Arena and Unicoi County's Red Fork Falls. Ticket cost: $2. Overall odds of winning: 1 in 4. Lucky 7's: Find three 7's in a row on a "tic-tac-toe" board and win up to $7,000. Ticket cost: $1. Overall odds of winning: 1 in 5.  Stop & Buy on Highway 70 in Liberty - Owner Don Crook says he opened at 6 a.m. as usual on the kick-off day.  Aaron Tippin Outdoors on Highway 70 in Dowelltown, at the outskirts of the Smithville city limits, opened at 12:01 a.m. on Tuesday morning to sell tickets to those anxiously waiting to join in the lottery fun.  Kwik n' Ezy Exxon on East Broad Street in Smithville, which opens at 4 a.m. every morning.  Mapco Express (Delta) on East Broad Street in Smithville, which is open 24 hours a day, also began their ticket sells at one minute after midnight on the first day approved to sell tickets. Though the lottery is opening for business this week, it will be some time before the big money drawings take place. Scratch games will be used to initiate Tennesseans to the lottery, however it will take about 60 days before tickets for big money drawing games will be sold. Fun and games aside, all profits will go to specific education programs. Most immediately, the Lottery is charged with raising at least $88 million by July 1 in order to fund scholarships for an estimated 65,000 students expected to attend Tennessee colleges and universities next fall.